MOTHER EARTH, MOTHER DINOSAUR Giclée archival prints (16” x 20”) on watercolor paper for sale for $250 plus shipping and handling! These quality reproductions are signed and dated by me, artist Hallelujah Truth (aka RuthTruth and Ruth Schowalter) and my brilliant husband Chiboogamoo, paleontologist Anthony Martin (one of the three co-discoverers of Oryctodromeus cubicularis). Hallelujah Fellow Pilgrims! What are your LIFE'S POSSIBILITIES? This is a question we ask each other in weekly coaching calls as members of Artist Conference Network (ACN). One of my persistently evolving answers is "connection with the world through my art." The leap from this kind of "INVENTIVE SPEAKING"--another term used in ACN coaching--to taking REAL ACTION is demandingly challenging! To leap into the world and CONNECT through my art means I need to establish a practical road map between me, an ART PILGRIM, and other PILGRIMS whether you are other souful artists, scientists, managers, teachers, computer analysts or any other person who might come across my blog with its HALLELUJAHS and inquiries into the SPIRIT! As I journey serenely along my artistic path unfurling infinity, I have been focused on authenticity and immersed in process. 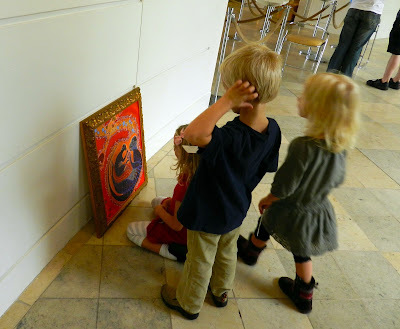 I value the BEING IN ACTION (another ACN term) far more than I do deciding what to do with a completed piece of art. The discovery that most VIEWERS of my completed work want to engage with me solely as consumers and not SOULFUL FELLOW SOJOURNERS has been shockingly disappointing to me. Consumers empower themselves by telling me what subjects I should paint and how to paint them in order for me to "win" their dollars. Where is my AUTHENTICITY then? This market place "exchange" rings hollow for me. Absent is the MEANINGFUL dialogue I hunger for. Instead of unveiling their SOULS to me as I have done for them through my art, these consumers helplessly wave their wallets like magic wands! But to no avail. A financial exchange must be done in the presence of SOULFUL DISCUSSION in order for me to sell my work. That is the fee I charge to potential buyers of my work. Fortunately--Hallelujah!--there are a myriad of ways for me to accomplish one of my LIFE'S POSSIBILITIES--"connection with the world through my art." Selling my art is only one! My blog, "Coffee with Hallelujah" has been tremendously successful in reaching a wide world audience. Since May 2009 when I began "Coffee with Hallelujah," in addition to 12,753 hits from the United States, I have had hits from the following countries: Australia 1, 145; United Kingdom 1, 081; Canada 620; Russia 603; Germany 495; India 401; France 323; Slovenia 175; and Ukraine 144. These statistics just site the top ten countries! As of February 26, 2012, I have received 22,170 hits. I am satisfied. It then seems possible then that my blog, "Coffee with Hallelujah" may be a way to sell my work in a way that supports my QUEST TO BE AUTHENTIC. 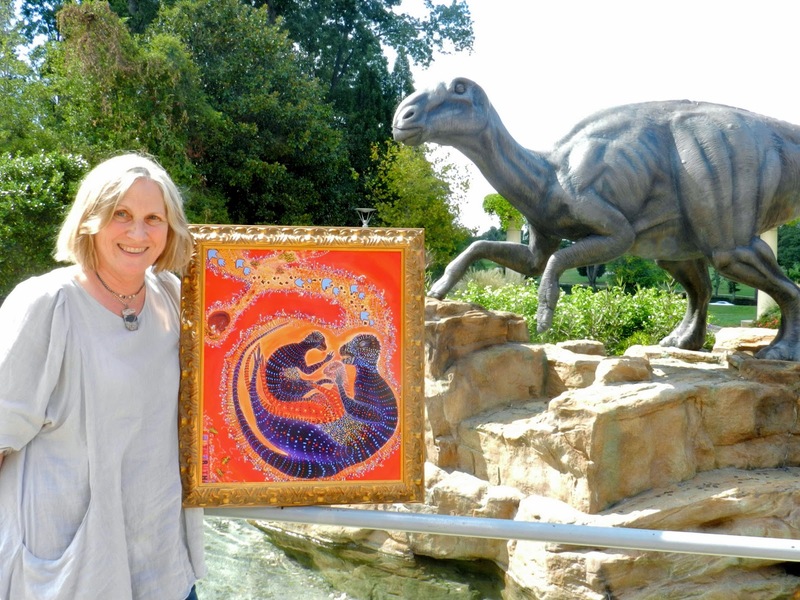 Upon request, I have had quality reproductions made of my painting, “Mother Earth, Mother Dinosaur,” which since I completed it in 2007 has been well-loved and presented far and wide! This image has appeared in international paleontological presentations, been printed on commemorative t-shirts for the 2008 “Dinosaur Dreaming” dig-season in Victoria, Australia, and been published in the 2010 book, Dinosaur Dreaming: Exploring the Bass Coast of Victoria. “Mother Earth, Mother Dinosaur” also graced the front cover of a book published in Spain, A Burrowing Dinosaur, a bilingual text published by Fundacion Conjunto Paleotologico de Teruel- Dinopolis. As recent as 2011, it was exhibited in Atlanta, Georgia, USA, at Fernbank Museum of Natural History and was selected for and shown at the Science Online 2012 conference at Duke University, North Carolina. Therefore FELLOW PILGRIM if you are interested in purchasing a reproduction of "Mother Earth, Mother Dinosaur," you can find more information about the meaning and history of this painting below. In addition to the 250 dollars (and cost for shipping and handling, I request that you respond to my blog and share your SOUL with me. Why are you drawn to this image? Where will it JOURNEY once in your hands? What do you wish to gain from possessing it? What is in your HEART? That's Coffee with Hallelujah! Thank you FELLOW SOJOURNERS for allowing me to share my LIFE'S POSSIBILITIES and to advance my understanding of my JOURNEY! I look forward to our MUTUAL SOULFUL EXCHANGES. “Mother Earth, Mother Dinosaur” reflects my interpretation of a new species of dinosaur reported in the March 2007 Proceedings of the Royal Society of London B. An adult dinosaur was found with two juveniles in their burrow, where they had rested for 95 million years. Scientists had thought that some dinosaurs should have burrowed in the Cretaceous; however, until Oryctodromeus cubicularis (digging runner of the lair)—the scientific name assigned to this burrowing “mother” dinosaur—no evidence had been found to support that hypothesis. As I painter, I was given special insights into this animal and its burrow with young because my husband, Anthony Martin of Emory University, was a co-discoverer of the new species with David Varricchio of Montana State University and Yoshihiro Katsura of the Gifu Prefecture Museum of Japan. Interpreting behavior from the fossil record is challenging, yet these findings indicate that mothers stayed with their young and maintained some kind of family structure. The findings also show evidence that mammals and insects co-existed with the dinosaurs. Small structures suggesting bee burrows and a small mammal burrow were found off the main burrow of the digging runner’s. 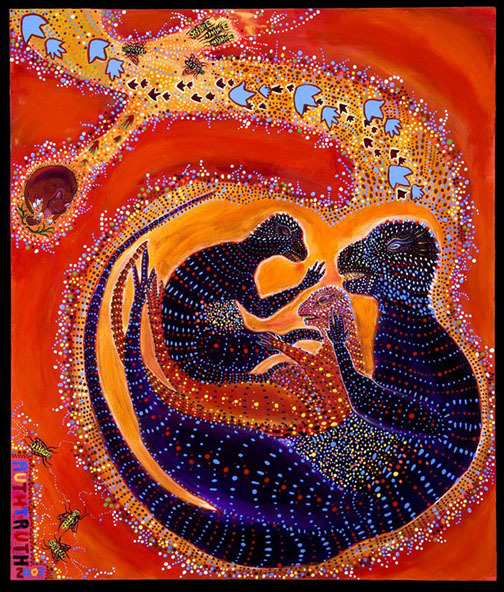 In painting this image of “Mother Earth, Mother Dinosaur,” I wanted to convey both a “womb,” where the dinosaurs were more than likely born, and a “tomb,” where they died when it appears the burrow was flooded. I also wanted to give the feeling of the “mother earth” holding these creatures for all this time to be given a new birth during our life times. Finally, I wanted this painting to depict something more human and universal, resulting in a a mandala-like design, which for me depicts the birth-death cycle of all life forms. Giclée archival prints (16” x 20”) on watercolor paper for sale for $250 plus shipping and handling! This giclée reproduction is smaller (16” x 20”) than the original painting (18” x 22”). The word, “giclée,” is a fine art term which describes a printing process to reproduce an original piece of art work. Printed on high quality watercolor paper, the giclée reproduction is made with fade-resistant archival inks, which will last 200 years (not as long as the dinosaur bones and burrows). The original “Mother Earth, Mother Dinosaur” was done in acrylic on wood.These quality reproductions are signed and dated by me, artist Hallelujah Truth (aka RuthTruth and Ruth Schowalter) and my brilliant husband Chiboogamoo, paleontologist Anthony Martin (one of the three co-discoverers of Oryctodromeus cubicularis). HALLLEUJAH TRUTH WITH MOTHER EARTH, MOTHER DINOSAUR. My Chiboogamoo took this photo of me to capture the excitement I felt at having my work displayed in Atlanta's Fernbank Museum of Natural History! What a fantastic way to connect with the world through my art! Looks great without the border, too!